The most legendary Metal act of all time will be stopping in Kansas City next year! Metallica has been touring almost non-stop since the release of their Hardwired…to Self-Destruct album was released back in 2016. Last summer the band performed at several stadiums across North America, but they decided we needed more Metallica and, if we’re being honest, they’re right. 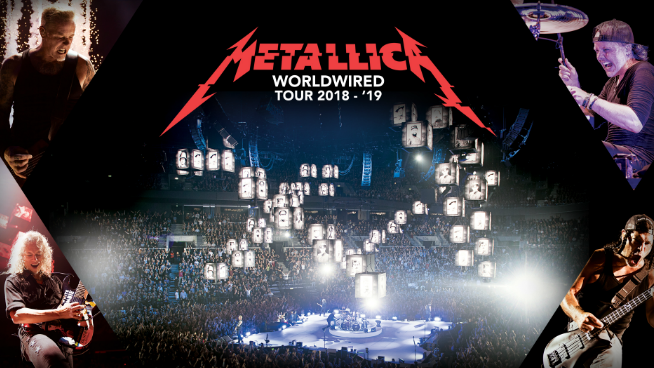 Metallica will be bringing the Worldwired Tour back to the US starting this September and going all the way until March of 2019. They’ll be stopping in Kansas City for a show at the Sprint Center on March 6th, 2019. Tickets to the Kansas City date go on sale Friday March 16th at 10 AM! We will also have an opportunity for you to WIN tickets to the show, so keep your dials turned to V100 and don’t miss out on this amazing show! Last summer, Metallica invited Avenged Sevenfold to tour with them, but there has not been any information released regarding the supporting acts for this run yet. Take a look at what it was like the last time Metallica came to KC!